Your laptop speakers aren't gonna' work for this one. The bass frequencies coming out of the left side filter, set to notch mode, are rich and can add a certain depth to any signal. In this case, its the Machinedrum. The right side filter is set to 6dB high pass mode. We use the triangle LFO to modulate the cutoff frequency and then some of the resonance. We're also modulating the filter in parts with the envelope. You have both positive and negative envelopes at your disposal as well as two EG's that can control the VCA or filter(s) or both. Hopefully this video will come through in a high enough quality to notice the very fluid tone of the filter. This video shows a more subtle side of the Schippmann. There's more to come as we delve deeper, start to use some of the back panel features and stir up a raucous! We are excited to announce that we now are carrying the incredible lineup of guitar effects pedals from Catalinbread. Like all our other products, Catalinbread pedals are of the highest quality and have superb sound quality. Pedals like the Teaser Stallion, an awesome overdrive pedal with switchable feedback loop, or the pint-sized Valcoder square wave tremolo are welcome additions to the Big City Music product range. Check em' out! This has to be one of the most affordable, incredibly fun modules ever made. You can get phaser, flanger, slapback, echo, and other crazy sounds out of the rs120. The module is based on an analog BBD delay. There is CV input for the delay time and if you turn up the resonance it will most definitely grow a self-oscillating feedback monster. Or, it could play nice. Here you hear the Jomox 888 drum machine running into the rs120 and later on in the video we use an rs85 LFO ramp-down wave to modulate the delay time. You can attenuate the amount of CV in directly on the module. Dude. The rs290's digital delay has a send and return function that allows you to affect just the repeats. You can do this either before or after the delay. in this case we're filtering the delays with the rs110 Multimode Filter. The rs290 Delay is also MIDI syncable and will give you a read out of the current tempo divide rate and allows to adjust how delay in relation to the MIDI time code. The delay is also syncable to an external trigger signal like a seguencer. Part three is coming soon! 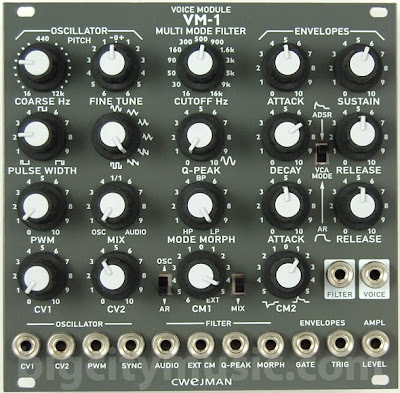 Cwejman Modules In Stock Now! 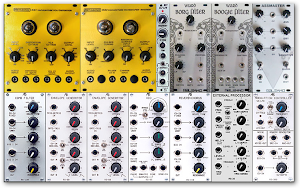 We are very excited to have nearly every Cwejman Eurorack module in stock now. With their amazing sound quality and superb build quality, they integrate perfectly with the Analogue Systems modules! The Ebbe and Flut is an amazing dual analog multimode filter. Virtually every type of low, high and band pass filters are available at the turn of a knob as well as notch and and allpass modes. You can fade between the two sides, mixing the two filters or using just one or the other. There's a built in noisegate and two envelopes that can control the VCA. There is also high quality distortion and compression. There's a built-in LFO as well for modulating the filters. And that's just part of the front panel! Here we put a beat from the Machinedrum into the rs290 in sampler mode. Using CV outs from an envelope generator you can start and stop playback and recording. We use a third EG to modulate the sample pitch/speed and then try out different waveforms from an LFO. You also have direct knob access to the sample start and end times which can be great for repeater-type effects. This module has a great digital delay with delay times up to 26.8 seconds and also has a great sounding tape delay mode. You can save presets too! There's also an expander module which gives you MIDI control over sampler functions, the rs295. 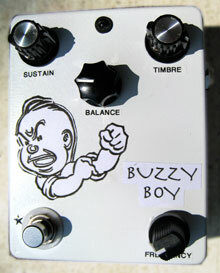 Dirty Boy Announces a New Pedal- The Buzzy Boy is Here! Blues and Alex from Dirty Boy Pedals have released yet another amazing pedal, the Buzzy Boy. The Buzzy Boy is a fantastic sounding, extremely versatile work of genius. With more fizz than fuzz the Buzzy Boy gives you a certain clarity that a fuzz pedal can't and it has the frequency selector switch you'd expect from Alex. Just check out the sound samples played by the man himself, Blues Saraceno. is a great sounding filter! It has Low, High, Band, and Notch filter capabilities and a very handy trigger switch for engaging or disengaging the filter momentarily. The sequence ran into the Action Filter is a combination of Elektron Machinedrum and the Cwejman S1 MkII. The Analogue Systems rs300 CV/MIDI eurorack module allows you to take a control voltage and convert it into virtually any kind of MIDI message. In this case we're using the Analogue Systems rs35 External Processor module to convert the Moog Cherry Etherwave theremin audio into a pitch control voltage. That control voltage in turn is controlling the pitch bend of the Dave Smith Prophet '08 keyboard. By setting the pitch bend range on the DSI you can decide the range of the theremin's control. The rs300 module can actually control multiple MIDI parameters at one time. For recording synthesists the rs300 can be an invaluable tool for recreating complicated modular patches and sequences. What you hear in this video is a fairly lifeless sounding Strat running into a Fender Princeton amp at low volume. When the Box of Metal is engaged - Instant MONSTER! This new Vexter version costs far less than the original, yet still has the same features and tone. The 3-band EQ makes this pedal really versatile and the built-in noise gate keeps all that massive gain under control. Fun pedal! We're using the Metasonix TM-3 Dual Oscillator as a source with the audio outs of a DSI Evolver keyboard controlling the CV inputs of the TM-3. The TM- 6 Multimode filter is next, then the TM-7 Scrotum Smasher Distortion. Not shown are the Vermona Retroverb and a Moog MF-104z Analog Delay. Check Out Andrew Parker's Mega Modular Planner!